Musical talent runs deep in the Buckley family. Mick, Sharon and their four youngest children have recently returned from the USA, where their family band, The Buckleys, played shows in Nashville, wrote songs with Grammy-nominated country music songwriters, and met with record labels. 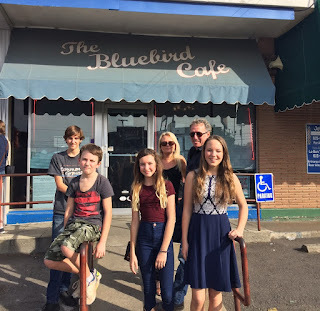 They played at the famous Bluebird Café, on the same stage where Bob Dylan and Taylor Swift have trodden. “For them to get invited to play there, that was cool, man,” says Mick. Sisters Sarah and Molly are out in front on guitar, mandolin, ganjo and vocals, while brother, Lachlan, plays bass and dad, Mick, keeps time on the kit. “We’ve been around instruments our whole life,” says Molly. “We’ve always been writing songs,” ads Sarah. The US trip was a dream come true for the girls, who love country music. Lachlan prefers ‘70s and ‘80s rock and roll over country, but he “does what we tell him to”, jokes Sarah. Mick starts singing a Deep Purple riff in solidarity and Lachlan just laughs. The band went to the Tamworth Country Music Festival to busk, and ended up in the grand final of the busking competition, playing on the main stage to thousands of people. Since then they’ve gone from strength to strength, appearing on the bill at festivals up and down the east coast, and winning song-writing accolades in the USA. Mick was brought up in the traditions of jump swing and 1940s boogie woogie. “I had six sisters, and my dad and my uncle played boogie woogie New Orleans piano. Apparently I used to sit on their knee and all my sisters used to sing in the lounge room in north Sydney,” he says. He got taught a few chords on the piano and the rest is history. Mick has had a successful and varied musical career. He’s played in bands since high school, and has been a professional musician ever since. He spent several years as the drummer for the legendary pub rock band, The Radiators, touring constantly. “Playing 6 nights a week, full houses everywhere. 1980s A Grade rock and roll, really crazy stuff,” he says. Apart from those rock and roll days, most of the music Mick plays is grounded in jump swing. “You go out and play all sorts of stuff, but it’s always based on that,” he says. “It’s all about entertaining. Smiles on dials,” he grins. It’s how he turned himself from a drummer into a solo pianist playing in clubs around Sydney. “I knew how to play rockabilly piano. There was a job going at Penrith Panthers Leagues Club for $350 a night playing a grand piano. So I got that job, wearing a suit and tie. I had an hour’s worth of material, and I needed 4,” he chuckles. That led to Mick joining the Yee Haa Boys, a country swing band who had several hits and top ten country singles with songs he had written. These days Mick has a number of ensembles that keep him busy: a big band, two duos, a jump swing/rockabilly band and solo work, as well as the family band. At the moment The Buckleys are busy working on some more songs for an album (they’ve got an EP already), as well as co-writing songs with songwriters in the USA.